In The Giver, Jonas is scolded for using imprecise language of “starving”. He is assured by the community that he will never be starving in his life. Isn’t it ironic? "It’s ironic, a little too ironic don’t you think?" Aside from Alanis Morisette’s literary lyrics, irony is a common rhetorical device used to add drama and mystery. Lois Lowry uses irony to create complicated layers of ethics, emotion and morality in The Giver. The Giver is the groundbreaking 1994 Newbery award winner in which a young boy, Jonas, is sorted into a painfully real career receiving memories from a tired Giver in a seemingly perfect community. What ‘irony’ is may well be a hot topic of discussion among librarians and English majors on cold afternoons. Irony may be confused with a handful of other rhetorical devices that also contain contradictive elements. These include malapropism and oxymoron. Yet irony is not malapropism: a situation where a word is incorrectly yet deliberately used, often for comic relief. Also, irony is not oxymoron: when something directly contradicts itself, such as ‘jumbo shrimp’. We can recognize irony by its three Halloween-themed disguises: Situational irony, verbal irony, and dramatic irony. There's also Socratic irony, or questioning to lead another to a seemingly self-created conclusion. However, Socratic irony will not be discussed in this article as it is mainly philosophical. For further reading on this, pick up Plato. 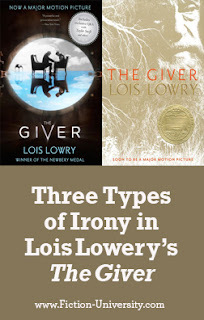 Lois Lowry incorporates the three types of irony in The Giver. Situational irony is when both the audience and the characters are unaware of the full implications of a situation. This occurs during Jonas’s Ceremony of Twelve. The Ceremony of Twelve, for all the muggles reading, is a Harry Potter-esque scenario in which the children of the community are sorted into their best-fit careers. It's evident that Jonas feels some uncertainty about which job he will be assigned, shown through talks with his peers and parents. Jonas expects a normal ceremony without any jarring surprises. This is not what Lowry delivers. One by one, Jonas’s classmates are called and successfully assigned jobs for their futures. However, Jonas’s number is skipped. In trepidation, he "didn’t dare to turn and find his parents in the crowd. He couldn’t bear to see their faces darkened with shame." The reader and Jonas believe something terrible has occurred. Why was his number skipped in a community where everything is precisely executed? There's something awry in this scene, but we don’t know exactly what yet. Then the Chief Elder adds another layer to the story when she explains that "Jonas has not been assigned…Jonas has been selected." This rare honor gives him a prestigious place in the community. This event is different from the character’s and reader’s first reaction. We keep reading. Verbal irony is when spoken situations contradict themselves. An example in The Giver is when the Chief Elder says, “Thank you for your childhood.” This example takes place at The Ceremony of Twelve: During the sorting, the children’s’ futures are analyzed by an intense counsel of leaders, led by the Chief Elder. At the sorting, the elder thanks the children with her statement above, indicating the kind of thanks one might receive after a breakup. In result, the reader is left confused, taken aback, and a little uncomfortable. We keep reading. Dramatic irony is when the audience is aware of the situation, but one or more of the characters in action are not. This happens through “twists” and “turns” within contemporary writing. Lowry uses dramatic irony more than once. As we meet Jonas’s father, we learn that he soothes babies and sometimes even, shockingly, bends the rules. Once, he illegally gave a baby a comfort animal (aka toy). Father begins as a likeable, humming character. Father. Hmm…there’s a certain, familiar ring to that. Doesn’t he just have the most relatable name? Perhaps the absence of Jonas’s father’s name creates the impression that the family unit is impersonal and cold. We come to learn that all parents are given this name, but the tone is more of that of a standard uniform. While you and I might know our parents’ first names, Jonas and the other children do not wonder such things. As Jonas changes, he begins to question this. Ultimately, Father breaks a human code of conduct. The act is part of his job. We learn of Father’s actions, through Jonas because Jonas is entitled to certain privileges in his role of the Giver. As Jonas watches a security video of his father committing this act, Jonas’s perception of life changes. It is a pivotal moment in the story. However, Father does not know that Jonas has seen. He remains unaware. We keep reading. We believe Lois Lowry’s world-building and don't question the safety of the community. Yet in the last few chapters of The Giver, we see there are moral and ethical situations that are not as simple as they first seem. Lowry’s precise use of language compares and contrasts these pivotal moments of change. Irony can be a tool to keep readers engaged, turning pages, and in suspense.